Tip: It’s unlikely the venison will be completely covered by the wine, so do this early enough that you can turn the venison over after a few hours of marinating before you leave it for the night, then turn it over again in the morning. When you’re ready to cook the venison, heat 1tbsp olive oil in a frying pan and sear the venison all over in the hot olive oil, seasoning lightly with salt as you go along. Place the seared venison into a roasting dish. In the frying pan you used to sear the venison, fry off the onions for a couple of minutes, then add them to the roasting dish with the venison. Pour the wine with the cloves, thyme, bay leaves, redcurrant jelly and peppercorns over the venison. Cover with tinfoil and place in a pre-heated oven at 180°C (fan-assisted…if you’re using a non-fan oven, use a slightly higher temperature) for an hour, turning the venison over halfway through cooking and re-covering. 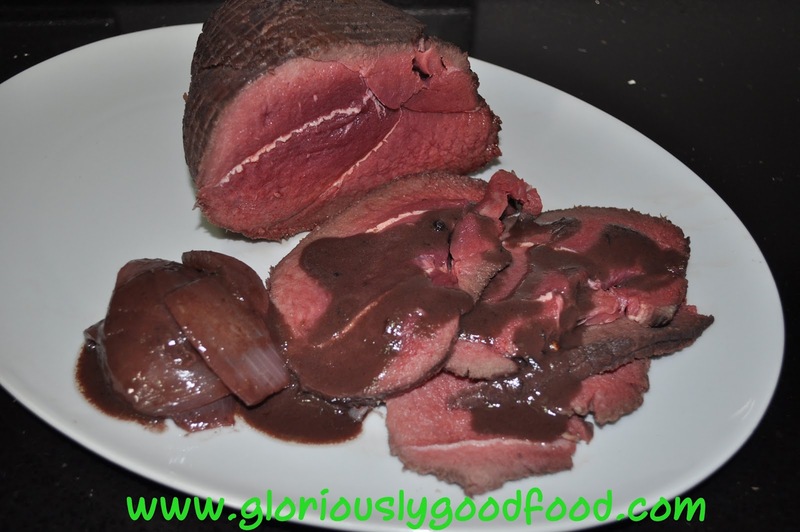 Tip: I like my venison very rare (nice and red inside! ), but for a medium-rare cooking, it is usually recommended to cook it for 20mins per 450g plus 20mins. I’ve gone for 20 mins per 500g plus 20 mins. Take the venison out of the cooking juices and place it in the tinfoil, wrapping it tightly so it will stay warm while it’s resting. Lift the onions out of the juice with a slotted spoon and set them aside. Place the rest of the juices into the frying pan you used to sear the venison (you can strain the juices if you prefer, but if it’s for a family meal, you can just pick out the cloves etc on the plate when you’re eating). Add 2tsp of white sugar and a sprinkling of salt, add the butter, then boil on a high heat until it reduces down to about half the volume and is a thick velvety jus (sauce). Add the onions to the jus to give them a glossy coating before returning them to a serving dish to serve as a side to the meat. Serve the venison with redcurrant jelly, a bit of jus and an accompaniment of vegetables and roast potatoes. 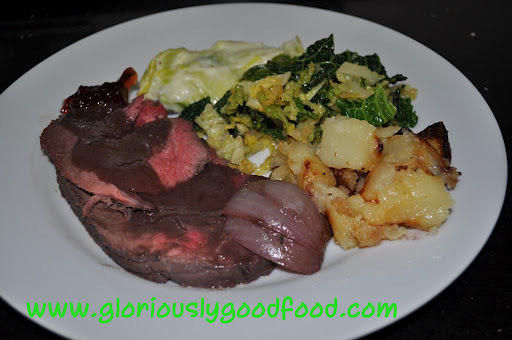 This entry was posted in Meat & Poultry, Winter Warmers and tagged cabbage with garlic and olive oil, creamy leeks, italian roast potatoes, leeks in white sauce, roast venison, venison, venison haunch, venison in red wine. Bookmark the permalink.